All-in-one collapsible wall berm offers effective spill containment. Heavy-duty, one-piece repairable membrane design. 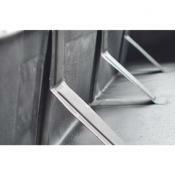 Built-in L-brackets provide sturdy support to the 12" collapsible berm wall. Easy to assemble/disassemble for fast response, storage, and re-use. Suitable for water, oils, solvents and chemical containment area. Versatile spill containment system is ideal for indoor and outdoor locations. Puncture, rip, and tear resistant - use in even rough terrain. Add Ground Mats and Tire Track Guards to maximize service life. 4 sizes up to 50' long for large-scale containment up to 4488 gal. sump capacity. 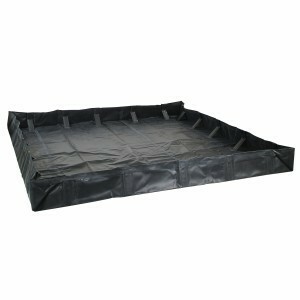 Set up an economical and durable collapsible spill containment berm anywhere you need in only minutes. 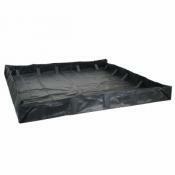 This all-in-one spill containment berm features built-in L-brackets on the sides for fast assembly and take down. Its collapsible wall design provides people and vehicles easy access to position equipment inside the spill berm. This makes it a great option under tanker trucks, as a decontamination station, and for maintenance activities requiring spill control. The reinforced materials resist tears and rips for effective, secure containment of chemicals, oils, solvents and water. Ground Mats and Tire Track Guards offer extra protection against abrasion and punctures from vehicles or jagged terrain. In the event of damage, use Berm Repair Tape for DIY leak-proof restoration. Simply clean out this spill containment berm system after use, fold for easy compact storage, and it is ready for service again and again. Enjoy superior return on investment due to this spill containment berm system's performance and longevity. 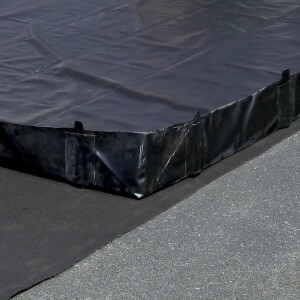 The heavy duty berm membrane provides outstanding spill control and resistance to rips or punctures. It also provides excellent chemical compatibility for efficient secondary containment. The spill berm's highly pliable, reinforced fabric is ideal for demanding applications inside or outdoors. Create ultra-containment berm protection against punctures from rough terrain or truck wheels with Ground Cover Mats and Tire Track Guard (sold separately). Easily repair tears with Berm Repair Tape. Collapsible spill containment berms fold to a compact size for simple transportation and to easily fit in storage cabinets. This also eliminates the need for a separate and expensive carrying case. Forget about ordering costly replacement parts for this rapid rise containment berm. L-brackets are welded inside and easily lock into place for sturdy sidewall support—lost pieces are thing of the past. Keep a roll of Berm Tape in your repair kit as a fast and economical solution for unexpected collapsible wall containment berm damage. Using Ground Mats or Tire Track Guards can help protect this secondary containment system to increase its lifespan. Use absorbents from your spill kit to clean the wall containment berm after service so it's ready for re-use on future spill prevention activities. The berm's economical design is quickly set up by hand to provide secure containment. Its built-in L-bracket walls provide sturdy support for the containment area but quickly lower for easy access. Vehicles can drive straight in. This collapsible berm's single piece, all-in-one design does not require a stake wall. The built-in brackets also eliminate tripping hazards unlike the PVC supports that stake wall containment berms use. This collapsible spill containment system meets SPCC and EPA container storage regulation 40 CFR. It is ideal for storage of larger containers, machinery, safety cans, or vehicles prone to leaks. Use for spill containment of large quantities of drums, frac tanks or IBC pump kits. 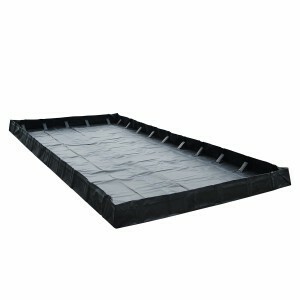 These berms offer effective spill prevention solutions in large outdoor areas such as construction sites or oil fields. The L-Bracket Instant Berm is available in various sizes from 6 feet to 50 feet long with sump capacity up to 4488 gallons. 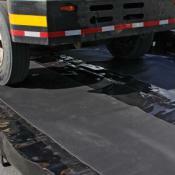 Black, 36 mil, 30 oz/square yard reinforced geomembrane material that resists tears, abrasions and chemicals. There are no known notices or warnings for this product. Prepare and erect the berm by pressing the interior L-Brackets into locking position, working your way around three sides. Leave the fourth side flat to allow equipment or containers to be loaded inside the berm. Position the optional Tire Track Guard matting inside the berm and align with wheels of the vehicle or container equipment you wish to load. Once your vehicle or equipment is in place, lock the remaining brackets into place to fully enclose the containment berm walls. If you have any questions, please contact us by email or call toll free (800) 869-9633. AbsorbentsOnline offer fast, convenient, and economical orders and shipping on all our products. 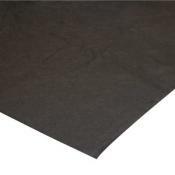 Ground Cover Mat – For 6 foot x 6 foot L-Bracket Instant Berm. Dimensions 10 feet wide x 10 feet long. Color: Black. Material: non-woven Geotextile felt like fabric. Weight: 8 lbs. Ground Cover Mat – For 12 foot x 12 foot L-Bracket Instant Berm. Dimensions 15 feet wide x 15 feet long. Color: Black. Material: non-woven Geotextile felt like fabric. Weight: 16 lbs. 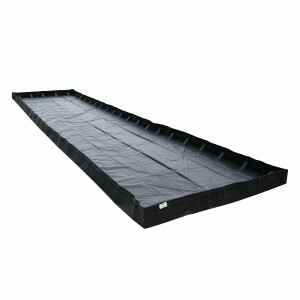 Ground Cover Mat – For 12 foot x 25 foot L-Bracket Instant Berm. Dimensions 15 feet wide x 27 feet long. Color: Black. Material: non-woven Geotextile felt like fabric. Weight: 22 lbs. 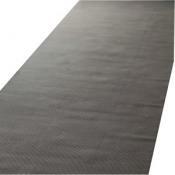 Ground Cover Mat – For 12 foot x 50 foot L-Bracket Instant Berm. Dimensions 15 feet wide x 52 feet long. Color: Black. Material: non-woven Geotextile felt like fabric. Weight: 50 lbs. 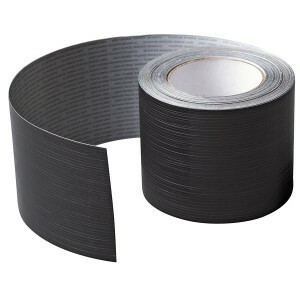 Berm Repair Tape – For L-Bracket Instant Berms. Dimensions: 4 inches wide x 50 feet long. Color: Black. Material: Permalon. Weight 3 lbs.